North Carolina's Republican Gov. 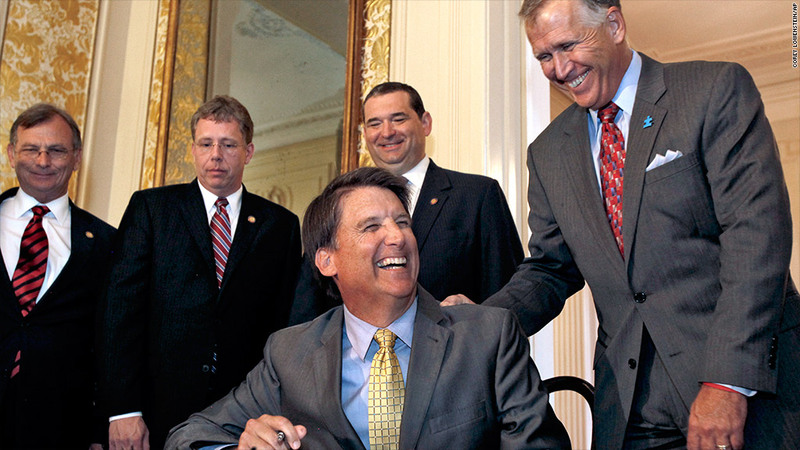 Pat McCrory, flanked by members of the state's General Assembly, signed the Tax Simplification and Reduction Act last month. It marks the state's first major tax overhaul in 80 years. Tax reform is still all talk, talk, talk in Washington. And many expect real action could take years. But not in North Carolina. The state has taken a very big first step in overhauling its tax code -- enacting its first major reform in 80 years. The change, signed into law last month, creates a modified flat tax system, with a single income tax rate, an increased standard deduction and fewer tax breaks, as well as the elimination of the personal exemption and a $50,000 deduction for small business owners. It also repeals the state's estate tax. "It's fairly radical in relation to other states," said Kathleen Thies, senior state tax analyst for the tax publisher CCH. Quiz: How many pages in the U.S. tax code? The overhaul has been lauded by Republicans, who dominate the state's legislature. They see the changes as a way to attract more business to North Carolina and create jobs. The big hope: The new economic activity will compensate for the estimated $2.4 billion revenue loss over the next five years as a result of the reforms. But the overhaul -- which represents a scaled back version of earlier proposals -- has been heavily criticized by many, mostly liberals. They contend its tax cuts will disproportionately benefit the rich and the revenue loss will cut into government services. Starting in 2014, the individual income tax rate will be 5.8%, and then it will fall to 5.75% in 2015. Those rates are down from the 6%, 7% and 7.75% rates currently in effect. The standard deduction, meanwhile, will more than double -- to $7,500 for singles, from $3,000; and to $15,000 for married couples filing jointly, from $6,000. The corporate income tax will also be reduced in 2014 to 6% from 6.9%. It will drop to 5%in 2015. And if revenue growth targets are met, the rate could go as low as 3% thereafter. For several reasons, North Carolina's reform strays from a pure flat tax system, which would simply apply one tax rate to income and wages, one to business income and a standard deduction for everyone. Instead, the Tar Heel state's tax overhaul still allows for several tax breaks on top of the standard deduction. Among them: charitable contributions, a child tax credit and a joint deduction for mortgage interest and property taxes. That combined real estate deduction, however, is capped at $20,000. That could reduce the value of those tax breaks for anyone who's now paying at least a 4% rate on a $400,000 or $500,000 mortgage or for someone who owns multiple properties, according to CPA Rollin Groseclose, who is based in Asheville, N.C.
North Carolina's tax overhaul also strays from a pure flat tax system because individuals still must pay taxes on their investment income, which will continue to be treated as ordinary income. Lastly, the reform did very little to expand the list of services subject to the state sales tax, noted Groseclose, who is on the board of the North Carolina Association of CPAs. The independent association, which didn't advocate for any particular proposal, has been calling for a modernized tax code that is less dependent on personal and corporate income taxes, which can be volatile. The state's biggest opportunity for more revenue would be to apply its sales tax to services, Groseclose said. But the new reforms still leave most of them exempt. Indeed, he noted, only about 25 or 30 services are subject to tax -- such as dry cleaning. But another 165 to 175 could be -- such as CPA services. Groseclose sees the new law as a work in progress and expects legislators to continue to make adjustments in the next few years. It's hard to say yet what lessons North Carolina will hold for lawmakers in Washington as they seek to overhaul the federal tax code. While the chief tax writers in the House and the Senate may produce tax reform legislation this fall, few expect those proposals to get very far this year or next, a midterm election year. That's because both parties still can't bridge their most basic differences, such as whether reform should raise more revenue than the current system or not. But like North Carolina, it's a fair bet if they do get around to passing tax reform, the end product may not be as much of a one-eighty as reformers had hoped.